We the “Holsworthy Mafia” are always keep to help out with the community when its in need. We’ve put our hands into our pockets again to hand over two second hand Apache Helicopters with less than 100K miles on the clock. These Helicopters come armed with the M230 chain gun as well as its original missiles. 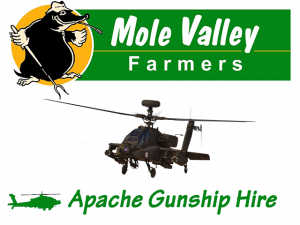 Mole Valley have said “we are pleased to announce the new Apache Helicopter fleet and will be renting these fearsome choppers to anyone who has suspicion of trespassers or thieves”. Mole Valley said these helicopters will become available within the third quarter of the year and that the price will be £1299.99 (EX VAT) per 48 hours and fuel is included along with a starter set of ammunition (3.5 tonnes). Pre-orders are being taken now at your local Holsworthy store. PS – An AC130 call service will be available 24/7. This service is PAY AS YOU GO and billed at £50 (EX VAT) per shell. Just call our local store and ask for the AC130 Service.